About three songs into his 2 ½ hour set at the Spokane Arena on Sunday night, Elton John turned to the packed house and said, “We hope you like what we’re gonna play tonight.” Sir Elton needn’t have worried, however, because it was plain that the adoring crowd was eating out of his hand from the get-go. John played only two songs from his most recent album, Wonderful Crazy Night — “Looking Up,” a reasonably catchy, up-tempo number, and “A Good Heart,” a pretty standard ballad that John called his favorite from the record. He wisely positioned them at the front end of the set list, which was otherwise dominated by his biggest pop hits. He also threw in a couple out-of-left-field choices: “Have Mercy on the Criminal,” from the album Don’t Shoot Me I’m Only the Piano Player, which has popped up on a few tours since the ’70s, and “Your Sister Can’t Twist (But She Can Rock and Roll),” a flimsy novelty song that prefaces “Saturday Night’s Alright for Fighting” on Goodbye Yellow Brick Road. It was good to hear “Burn Down the Mission,” a track from the oft-overlooked Tumbleweed Connection album that John has turned into a live show staple. John obviously can’t hit the high notes he once could — he leaves it to the audience to sing the falsetto chorus of “Crocodile Rock” — but he’s still a dynamic performer, and it’s obvious that he loves performing. 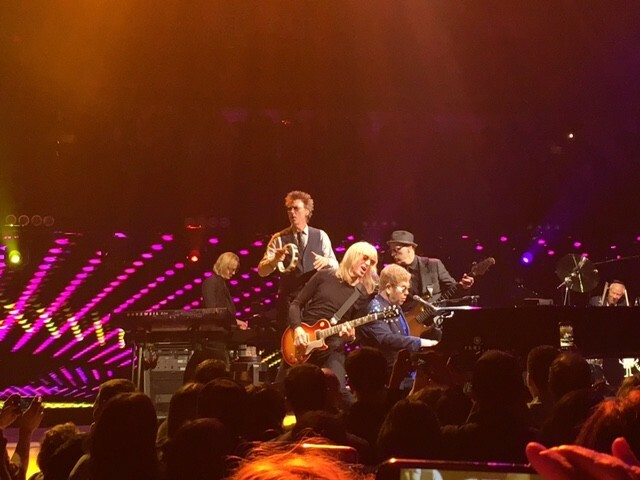 His backing band is tight, which isn’t much of a surprise, considering drummer Nigel Olsson and guitarist Davey Johnstone have been playing with John for decades. I also saw John’s 2011 Arena show, and last night wasn’t a huge departure from that concert. What I noticed this time, though, was how John really plays to the first few rows (I was in the sixth row), turning to the audience and directly engaging them as he plays. He also treats every song like it’s going to be his last, jumping up from his piano bench, pointing enthusiastically at the crowd, turning to all corners and bowing to each individual section. He’s works for his applause, and he earns it. One major complaint (which has nothing to do with the unimpeachable Sir Elton): Actually getting into the Arena was a nightmare, and judging by my social media feed last night, some of my friends had a much harder time than I did. The increased security measures are a plus, certainly, but there didn’t seem to be any clear organization or visible signage, and I saw multiple lines bottlenecking and converging into one unwieldy mass of people near the entrance. I was queued up at 7:15 pm and didn’t get into the venue until 8:10 pm, right as the concert started; others missed a good chunk of the show standing outside in the cold. Waiting in line is an unavoidable part of the concert-going experience, but this was a mess. The Arena’s staff (at the least the folks I encountered) couldn’t have been friendlier, but the management needs to get this fixed.